Off and on for the last year, we have been following the progress of a studio at the Architectural Association tasked with this central question: Can extremes of programmatic effectiveness blend with the fragility of human habitat? Most of the students approached the problem via industrial food production, which when blended into the city can create urban Edens in one extreme or situations reminiscent of the stockyards in Upton Sinclair's The Jungle in another. Intrigued by their investigations, we asked the tutors, Nannette Jackowski and Ricardo de Ostos, the duo behind the spectacular Hanging Cemetery of Baghdad and the newest pamphlet, Untold Stories, for images and any explanatory text. We like four projects in particular, so much so that we've decided to post them individually. 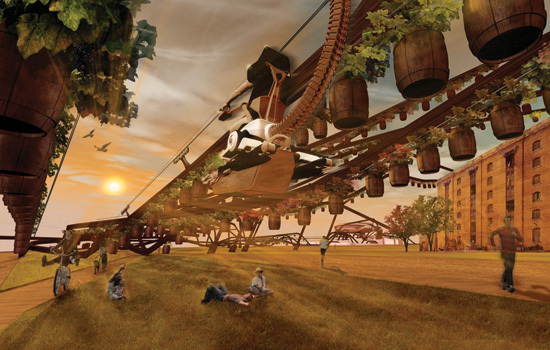 The first of these is a proposal for an airborne vineyard by Soonil Kim. Inspired by the urban grains especially the railway network from both St. Pancras and King’s Cross Station around the site, the design is a formal continuation of the topography while reinforcing the colonisation of air space by winery branches. 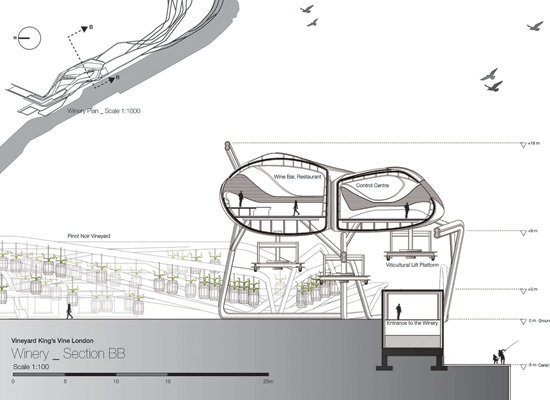 The audacious structure, the winery and the vineyard for red wine grapes are connected by a suspended transport network enabling the use of ground space for a public park. With a capacity to produce 10,000 bottles of red wine annually the project re-articulates private and public space blending productive infrastructure with quality areas to Londoners and tourists. One can certainly imagine such a network built to grow others things, such as vegetables, herbs, fruits, cash crops, commercial flowers and plants, with the winery turned into a farmer's market. Need more space to grow? Simply extend it. Cities may have a lot of rooftop space for farming, but the negative space above people's heads is exponentially greater. A tentacled superorganism creeping out rhizomatically to the suburbs and towards sunlight. Sheesh! Couldn't the tutors have just said "industrial food production" or "urban agriculture" instead of "extremes of programmatic effectiveness"? All these architecture-speaks are so pretentious and embarrassing. Hey Anon, I don't think the studio was specifically about "industrial food production" or "urban agriculture". I think the question was written so as not to pigeonhole the students into one direction. Ideally, a studio topic should invite multiple lines of investigation. "Extremes of programmatic effectiveness" may refer to stormwater and sewage treatment plants or trash processing sites. It just so happened that a lot of the students took up urban agriculture as a means to explore the central question, and the four projects we have chosen to post are in this group. Of course, you can also say, "Well, urban agriculture as a topic can also invite multiple lines of investigation. True, but it's the tutors' prerogatives to choose whatever they consider to be an interesting/important problem to study for their own studio. Meanwhile, what do you think of the vineyard? Hate it? Like it? Ambivalent? Speaking of trash processing sites, today on BLDGBLOG: Waste Towers. the vineyard is an interesting concept, not sure of its effectiveness however. The best part about axis facade's comment is that he (?) has failed to properly link to his own page in the midst of his blog-whoring. blog-stroking aside, this project's execution is a continuation of the metabolists of the 1960s, with updated rhetoric: megastructure=superorganism. What's more audacious is the implied claims about the space underneath the laundrylines of wine grapes: park, really? If you're going to cover the sky, there better be something amazing on the ground so people don't reminisce about seeing the sun and moon. 1) These "laundrylines" needn't have to cover the sky. 2) These "laundryllines" don't completely lack interest to everybody. 3) A park needn't have open skies, i.e., fully canopied forests, too, can be programmed as parks (and indeed they are, in my opinion). 4) If you need open skies, there presumably would still be other parks. Though I was certainly imagining this vineyard colonizing all interstitial spaces in London (not Soonil Kim's intention, I think), it can be pruned. 5) Would people living in cities (the densest ones) have much to reminisce about the moon, being so often blocked out of everyday experience by light pollution, buildings and blogging? 6) I don't think people "see" the sun, so much as vicariously experience it (among various ways) as shafts of light breaking through branches, buildings, windows -- and soon through vineyards. And seeing sunlight filtered through leaves not one of the safest ways to "see" a solar eclipse?